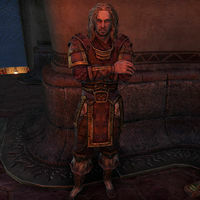 Erikar Five-Blades is a Nord armsman and member of the Fighters Guild who can be found in their guildhall in the Canton of St. Delyn the Wise in Vivec City. "The Fighters Guild goes where the battle takes us. Even this land of puny Dark Elves and bugs as big as a mammoth!" "I'm not sure I'll ever get used to that huge rock floating over our heads. No wonder the Dark Elves act so crazy all the time. This land of theirs—it's like Oblivion, except with slightly better refreshments." "Looking to join up? Well, you appear to be Fighters Guild material! Go see the Hall Steward and she'll fill you in on the particulars." This page was last modified on 7 March 2019, at 13:07.